Serving Northern Berkshire County individuals, families and businesses since 1896, SBM is well positioned to provide customized insurance protection for the next generation as well. 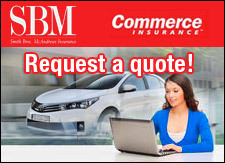 We want to be your insurance agent. As a Trusted Choice independent insurance agent, our strength lies in our ability to provide our clients with a variety of options from many well -respected insurance companies. A clear advantage of working with an independent agent is that you the customer, get many options. Our job is to effectively compare important coverage options and rates and to help you make the best decision for you and your family and/or your business. You deserve appropriate insurance protection at a competitive price. The advantage of working with local insurance agents is that we are here for you. If you ever experience a claim, it is to your advantage to work with people who know you and will assist you in a difficult time. Our immediate and genuine response to you at your time of loss is the best policy that we offer. Massachusetts Auto Insurance became truly competitive in 2008 and SBM is ready to help you find the insurance company that will best protect you and your car. With many companies to choose from, and lots of discounts available, SBM will put you on the road safely. Homeowners Insurance is where you protect your biggest asset - your home. It is critical to make sure that you have your home insured at Replacement Cost so that you are properly protected in a total or partial loss. Because we represent a number of companies, we can help you protect your home …..And for that matter, Renters Insurance is just as important to tenants as homeowner’s insurance is for owners. If you live in an apartment, renters insurance will protect your personal belongings if a loss were to occur. Life Insurance. Whether you are trying to protect a mortgage, college education tuition, or simply the lifestyle that your family has grown accustomed to, replacing your income at the time of your death is a very important financial piece of the puzzle. SBM has several affordable options for Term, Whole Life, and Universal Life insurance for you to review. Business Insurance is a specialty at SBM: we are proud to protect the interests of local companies. Customizing specific insurance protection to fit your business is a priority for our agency. Managing risk is key to a profitable business. If faced with accidents, injuries, natural disasters, lawsuits and more, you need the right coverage in place to protect your enterprise. Your needs are unique and we have the right team with the right products to help you protect what is important to you. We have been a trusted partner in Northern Berkshire for many years. Let us provide a free insurance review today.